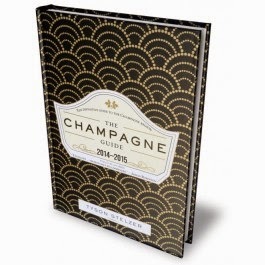 There have been several books written about Champagne over the past few years and most of them have been excellent. The latest entry is from Australian author Tyson Stelzer, who has delivered a work of great complexity and depth, somewhat akin to one of the great Champagnes he describes in this work. In other words, it's a must! Stelzer's love of Champagne comes through on every page in this book, be it reviews, photos - which he took - or essays on any number of subjects. It's a major work and above all, it's extremely well organized. All the information and tasting notes in the world wouldn't be worth much if the book wasn't a joy to read and look at, but this one beautifully pleases any reader's needs. Where to start? Let's begin with the tasting notes, which are among the finest I've ever read on Champagne. Stelzer's words perfectly sum up the distinctiveness that is at the heart of any special cuvée and he writes in such a way to thrill our senses, yet never does he talk down to the reader or write in a snobbish tone. For example, here is a passage about the 2008 Rosé from the excellent Champagne house, Deutz. "Capuring a knife-edge balance of breathtaking elegance and alluring fruit presence in vintage rosé is one of Champagne's finest arts, and Deutz has nailed it in this cuvée." I don't know about you, but after reading that, I want to try a glass! The 96-point rating that Stelzer assigns to this wine is another tempting factor, of course. Regarding the 100-point scale he uses (there are a precious few 100-point Champagnes in the book, wines that the author describes as "the pinnacle of character, balance and persistence), the author goes to painstaking lengths to determine why one wine is a 92 and another receives 93 or 94 points. There is a table at the beginning of the book in which Stelzer describes his definition of each score from 80 ("horrid") to 100. While I am not a fan of the 100-point scale, as it is a random ranking based on the author (Stelzer writes that one should only buy a 90-point wine if it's cheap), I have to give him his due for laying out his parameters and bringing detailed meaning to his scoring system. It may not be perfect (in reality, no scoring system is), but it's consistent and extremely well done. Then there are the gorgeous photos that appear throughout the book. They were all taken by the author himself and he's an outstanding photographer. As a photographer myself, I'm always looking for great photos everywhere and I can tell you that too many book these days feature photos (often black and white and not color, due to printing costs) that are merely "good enough"; in other words, they'll do, but the images are not especially sensual or beautiful. That's not a problem here, as Stelzer's photos are a major highlight of this book. Be it a marvelous image of a snow-covered vineyards in the town of Cramant or a charming shot of a pruning cart, Stelzer's images are imaginative and perfectly composed and communicate the striking beauty of this region. In today's visual world, I think it's important to feature high-quality images in a book, so thanks to the publisher, Hardie Grant Books, for doing this. There are several more aspects of the book I'd like to focus on, especially his selection of producers. Naturally the most famous houses, such as Krug, Moet & Chandon and Veuve Clicquot are included in the book, as are marvelous grower-producers such as Larmandier-Bernier, Jacquesson and Chartogne-Taillet. But Stelzer has also written about some tiny producers that are not well known, such as Emmanuel Brochet, André Clouet and Jacques Picard; I'd like to thanks him for writing about these small producers. I'm constantly amazed at the sheer number of labels in Champagne and while no book can even come close to mentioning them all, the author has given us an excellent cross section. There are also some introductory essays that are well written and thought out, especially the one about the nomenclature of the terms Grand Cru and Premier Cru and how these regulated terms need to be updated. Also very helpful are summary tables of the author's highest-rated Champagnes as far as various categories such as Best Rosés, Best Blanc de Blancs, etc as well as the best Champagnes in various price ranges. These tables are very helpful, especially when you consider that most readers will use the book again and again, both for reference as well as a shopping list. About the only criticism I have with this book - admittedly a minor one - is the inclusion of a few producers that have tasting notes for only one wine. I won't mention the producers here, but a few of them are ranked rather low. I'd understand an entry with one wine if it was highly rated, but for a score in the mid to high 80s, I wonder why the inclusion of these particular vintners. Other than that small point, I highly recommend this marvelous treatise on Champagne.